We were having a fairly calm day yesterday, resting between all the parties and before today, when Matt's childhood best friend (also Matt) arrived from Seattle for the long weekend. The kids were playing in the yard and I was having coffee on the back patio, looking over some materials for Julia's history lessons--I am still trying to deny that summer vacation is about to be over, but these lessons still had to be planned. All of a sudden, I realized that Sophie was barking, and so were Rosie and Riley, our neighbor dogs. Additionally, there was a very loud chirping sound, like a bird call, but I didn't recognize what kind of bird. I called to the kids to see if they were by the fence, since sometimes Rosie barks at them and then Sophie races to their defense, but they were nowhere close by. Upon investigation, we found two tiny squirrels at the bottom of the maple tree (luckily in the side yard, where they were protected from the dogs by being outside of the fences...) curled and crying that piercing chirp. They weren't newborn, because they had sleek fur all over, looking like miniature versions of squirrels except for their tails, which were smooth rather than bushy. However, their eyes were still closed. 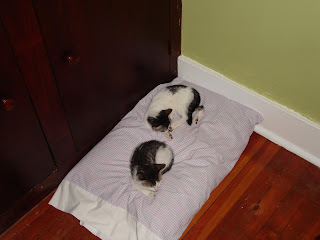 (We later found out via Internet that they were around one month old, since they open their eyes at 5 weeks. Since the dogs were distressing them so, we decided to bring them inside, so I carefully picked them up with a cloth diaper (not wanting to get a human smell on them) and put them into an unused 5 gallon aquarium we had in the basement with some hay and the diaper. One was noticeably stronger, and he moved around and burrowed comfortably into the hole in the top layer of the diaper. The other poor little thing sort of rolled into a ball and lay still. --Kent Animal Shelter, who told me to call Animal Control. --Animal Control, where I got an answering machine. --Petco, who told me to put them back under the tree for the mother to find, and if she didn't get them to call either Quogue Wildlife Refuge or another rescue place in Westhampton (but if I called them I had to say I FOUND them in Westhampton...) So we put them back out, hoping they wouldn't die in the night. They didn't, but the mama didn't come find them, either. --Quogue Wildlife Refuge, where I also got an answering machine. --my neighbor Suzy, who told me to call a vet because they usually sold formula for baby wildlife. Since they hadn't eaten in at least 24 hours, I was committed to getting them to eat. They'd eagerly taken a bit of the Pedialyte today--but as soon as they realized it wasn't their preferred food, clammed up and didn't want more. --Michelle, the angel of squirrels, who told me I could bring them right over! We hopped in the car with them and had them at her office right after that, and she said she'd call us after the weekend and give back the tank. So the story has a happy ending, thank goodness. I was picturing a sad little funeral for baby squirrels, and frankly wondering if a cat made off with them if I could get away with pretending it had been their mama! Strangely enough, Matt said that if we nursed them back to health, they'd be tame in our yard and wouldn't it be cool to be able to hand feed squirrels....yes, that would be adorable, but since we sic Sophie on squirrels at the bird feeder every single day, I don't see how it would work. Besides, I think you all know that we don't need any more animals to be responsible for!!!!! I have been really lax about posting lately--but with good reason. We have been having parties galore here--a barbecue for folks at Matt's office, Ben and Emma's combined birthday bash, and tomorrow a baby shower for my friend, due in October. My dear friend Jenn is also visiting from NC, and although she isn't staying with us, our daughters have had two sleepovers and we have seen their family nearly every day of their trip. Yesterday we decided to head out to the beach in the late afternoon--it had been threatening to rain all day and we'd put it off, but finally decided that we should just go. Luckily, it never rained at all, and we had a lovely time. Tide was low, so we walked down the beach and headed out on a sandbar, something I have always wanted to do since we moved here 7 years ago, but had never actually done! We collected a whole bucket of shells, including 14 conch shells (!) --a truly unprecedented number for us. We also found: the leg from a blue crab (these are a bright royal blue, truly lovely to see) a fish skeleton, completely picked clean, and two really nasty fish heads--I guess they had been bait at one time, but one of them had been gotten by seagulls and was just unspeakable. On the playground on the way out, Matt was pushing Emma in the swing. She was trying to tell him some long story--but so was Julia, and he couldn't understand either one of them. Finally, she shouted to Julia: "Jooya, you're instracting me!" (distracting in 3 year old....) It was very funny. Today we headed to the beach with Jenn, her dad, and her kids. Since they live in the western part of NC, they haven't seen the ocean since leaving Long Island back in December (or really, I guess, since the last summer) so they really wanted to go. It was just like old times--us in the chairs with the little ones digging and sitting in the big bucket, the boys running, splashing in the surf, building roads and forts, and the three older girls swimming nearly the whole time (though they did end up sunbathing near the end of the afternoon--yikes!) We got to talk and talk, and yes, there were interruptions from the kids as there always are, but it was nice just to be with her--the rest of this vacation of hers has been so busy that we haven't gotten to just sit much at all. The girls are downstairs right now, watching movies and giggling, and will probably be up till 3 am like last sleepover.....it will be hard to say goodbye again after tomorrow's party, that's for sure. Speaking of which, I have 36 cupcakes waiting to be frosted in the kitchen for said party...so I will sign off now. I will try to post more this week than I did last week! On this day last year, we closed on our house and spent our first night here! Yes, it was Emma's 2nd birthday, and we didn't plan it that way--but it was a happy coincidence. We weren't done with the closing till about 5pm, and then we went back to our rental house, picked up the kids and the dog, the birthday gifts, the cake I'd made that morning and the other van, loaded with essentials for our first few days, and drove HOME. Turning the key in the door for the first time was wonderful. We ordered pizza for dinner, and because we bought the house with lots of furniture and other things in it (the lady who had lived here since the house was built in 1950 had died; we bought it from her daughter and since there were many useful and beautiful things in the house we made arrangements for her to leave a lot in the house) had no problem eating dinner, with a table and chairs, dishes, a dishwasher, etc. Emma opened her gifts after dinner and we had fun playing and exploring every inch of our home. The work began the next day....painting, fencing, unpacking, cleaning, etc.---but that first night at our house was just fantastic. It feels like we've always lived here now! One bright spot was that Matt worked from home, which allowed us to have present opening early in the day rather than have her open while Daddy was at the office, or (much worse) trying to get her to wait until dinner time! She loved her silk dress up skirt and slippers (reversible panel skirt in sea blue and lime green with matching beribboned headband, and pink rose and ribbon covered shoes, perfect for dancing!) Her little Waldorf strawberry fairy doll was also a hit...she danced happily around the living room. We made French toast for breakfast--which ironically, the birthday girl and Ben both turned up their noses at! They'd already eaten cereal because I had to go to the grocery store for more milk and eggs to make the French toast, so I guess they weren't hungry! Anyway, it turned out beautifully. The rest of the day was a quiet one--movies, reading, playing, Matt working at the computer, playing with the kittens, Julia going to her friend's house in the afternoon, making cupcakes for the birthday girl. I made chocolate cake with vanilla frosting and chocolate sprinkles (and a green 3 on each one), then chocolate ganache with pink and white sprinkles (and the same green 3s on the other half of them) as per Emma's request. Ben and Emma also went outside in their rain boots and coats to splash in puddles and explore the yard--they lasted about 20 minutes, then came in and Emma had a bath! We had steak salad with blue cheese vinaigrette--yes, Emma eats that, but no dressing--for dinner, then sang to our birthday girl and had cupcakes. She was sound asleep before 8:00. The other day Ben, Emma and I were lying on my bed after reading some stories. Emma came out with, "When I grow up, I'm going to be a ballerina!" Ben's reply was, "Well, when I grow up, I'm going to be an airline pilot." Emma looked perplexed and said, "But you're my big brother!" Ben looked at her kindly and said, "Don't worry, Emma--I'm always going to be your big brother. I just want to be a pilot, too!" & all of my kids! Molly and Bo are good little kittens--mostly. They allow the children to play all kinds of games with them, including wrapping them up in blankets and carrying them around. Julia has made around forty cat toys, all on the same theme--ribbon, feathers, jingle bells and tape. They'll chase those things all day long. They already can climb stairs, so sometimes they go up and keep the kids company in their room. They use the litter box flawlessly. They have beautiful purrs, like to cuddle, get along with Sophie, and ignore Mimi. But. Matt and I go to bed between midnight and 1 am, in general. That's when the fun begins. They hop up on our bed, acting like they want to curl up and sleep with us--which would make sense, considering the kids have run them ragged most of the day. You'd think they'd be tired. But no. They roll around the bed with each other, biting each others' tails, making little mewey sounds, and occasionally diving for our feet if we move. I generally sleep without covers in the summer, even with the air conditioning on (at least till the dead of night when I sometimes get cold) but I have had to resort to the sheet over my lower legs so I don't get scratched! If we manage to get them off the bed, they start in with the curtains, or climbing up the wicker laundry hamper, or finding some tiny toy/ball/bell/dust mote/crumb on the floor, which they'll then pounce on, run up and down the hall with, and in general make it impossible to sleep. However, we can thank Rachel for the solution. 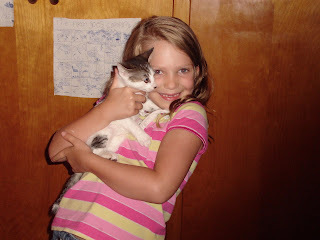 When we brought them home last Friday--it's already been a week--she lobbied to keep the cat carrier in a corner of the living room so they'd have a place to sleep away from Emma. She insisted that since they're just babies, they need their naps, and got the kids into putting them in the carrier occasionally to sleep. This has served us well when their antics are too much at night. I just scoop them both up and put them in the carrier. Wednesday night when I did this I didn't even lock the door, in case they needed the litter or a drink in the night. I didn't want to wake up to mewling (or worse, have them wake Emma!) They curled right up and we didn't hear from them again. But last night they were a little rowdier. About 20 seconds after I'd returned to bed, I was startled when both kits jumped up on the bed and resumed their play fighting as if they'd never been sent to time out! This time I latched the door, and we had peace for the rest of the night! Yay--here's one reason we can give Matt for getting two kittens! If we'd locked one kitten in a carrier, it would be sure to cry and protest, but Molly and Bo have each other and either curl up and go to sleep, or continue their game inside the carrier. Either way, we get a good night's sleep! For Saturday's barbecue I am in charge of dessert. (What a shock, to those of you who know me!) We purposely made the party potluck because it would be just too much to feed 30 people. So we are in charge of drinks, dessert, and I am making a pasta salad with veggies and feta, marinated green bean salad, and spinach dip in bread bowls--plus we will grill some sort of meat--chicken or a pork loin, probably. Also I got chips to put around, but everyone else is bringing meat, side dishes and party food to share. I decided on my signature chocolate picnic cake with cherry chocolate ganache, two Key Lime pies, and a vanilla cake with strawberry frosting. At first it was going to be a strawberry cream cake, but then I realized that I wouldn't have room in the refrigerator to store it--with whipped cream all over and strawberries, it has to be cold! So then I changed it to a caramel layer cake, but then I realized I was out of brown sugar and evaporated milk to make the caramel frosting, and I really want the cakes to be finished tonight. So strawberry frosting it will be. Basically it's a buttercream with strawberry preserves beaten in (along with cream rather than milk) and decorated with sliced strawberries. Should be good. Tomorrow I will make the pastry for the pies, and the lime filling. The whipped cream will have to wait till we serve. Weepy whipped cream is NOT a good thing! Tomorrow evening I will make the pasta salad, the green beans, and the spinach dip. I will also try to do the bulk of the cleaning, because on Saturday morning we have to "clean" outside--clean the patio, set the tables and chairs, rake up the straw from the chickens, de-poop the yard (what do you expect with a dog and 7 chickens?! ), fill the bird feeders, cut flowers, etc. I also can't make the spiked lemonade till guests are arriving because it has ginger ale, which would go flat. I do have to make the ice ring tomorrow, though...now I'm just thinking out loud! I got an awesome punch bowl and 35 cups from the thrift shop for $5 last week! (No the cups don't all match, but the bowl has 12 matching cups plus the hooks, and the remaining 23 cups are in 3 different designs. I don't mind as they're all very pretty.) We ran everything through the dishwasher with vinegar in the rinse cup, and it came out sparkling. It'll be nice to serve punch from a huge bowl rather than a pitcher, and with an ice ring made of lemonade, mint and lemon slices will be very pretty. I probably should go to bed....the thought of all the work ahead makes me want to hide! Next Wednesday, our friends come from North Carolina for a week. They aren't staying at our house, but we will be spending every available second with them, since we haven't laid eyes on them since they moved last December. Next Friday their family and my family--parents, brother & his family, sister and her family, and maybe (just possibly) my niece and her fiance from PA, and my niece and her husband and baby from DE--will be here for the birthday bash 2007 for Ben's 5th and Emma's 3rd. Then, the followign Tuesday, we are having a party AGAIN, for two reasons--the first is so that homeschooling friends get a chance to see Jenn and her family before they head home, the second for a baby shower for our friend Amie, who is having her second baby in the beginning of October. So, in short, I am absolutely crazy! Three parties in 10 days, plus Emma's birthday. That's a LOT of cleaning, baking, cooking, grocery shopping, running to the store for ice, decorating, etc. etc. It will be fun, but it will also be a frustrating time of trying to keep a thousand things in the air at once, and to keep the laundry from piling up too. So forgive the lapse. We'll be back regularly on August 29, with just about a week of summer vacation left--horrors! "I don't know who Maxime thinks she's kidding. If Hagrid's half-giant, she definitely is. Big bones... the only thing that's got bigger bones than her is a dinosaur." Some of you won't believe this, and some of you will believe it all too easily! Today we welcome into our family two little kittens, Molly & Bo! Well, the kids and I went to pick *one* out today, and we thought we wanted the male (there was 1 male, 3 females in the litter...) but when we saw them all, they were so cute, and after all, splitting up brother and sisters is so cruel, and we couldn't agree on which was sweeter, and the lady who had them, while very nice, didn't KNOW that cats could have kittens at one year old, which is why the mommy cat wasn't spayed yet.....I thought, if she doesn't find homes for these kittens what is going to happen to them? So I closed my eyes and said we'd take both. Matt reacted very well! We were apprehensive as to what he'd say when he saw them. He came home, and Julia was playing with little Molly on the rug. He smiled, and opened his mouth to say that she was so cute, when Emma blurted out, "And we have another one, Daddy!" At this point, I steeled myself for a blitzkrieg, but aside from a few snide comments, it was just fine. And when he made one comment about couldn't I have called him to ask if he'd mind two kittens, I said, "I didn't call because..." and he finished the sentence right along with me, "I didn't want to hear your answer!" They are too cute! Sophie loves them, Mimi hates them---I know, I was shocked too! They are still scared of Sophie, but they're very loving and friendly, and I'm sure they'll wise up that she's just a mush soon. 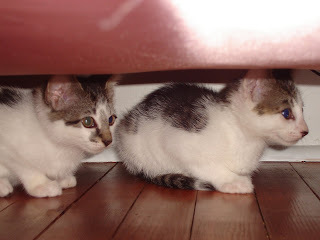 For the pictures--Molly is the one with the spots on her back, and Bo has the gray all over his back. Here's where you say, "AAAWWWWWW!" Today Rachel and Julia are painting the wooden bookshelves we used to use for school books for me! When I rearranged the shelves for the upcoming school year, I realized that the three cube shelves I was using (they are each divided down the middle so you can put the shelves horizontally or vertically depending on your needs) wouldn't be enough now that Ben has school books too. So I moved a bigger bookshelf out of the family room and up to the living room, and will move the cubes down to the family room...but on emptying them I saw that the white paint had chipped, gotten marks from moving and from a few pens (!) and just looked lousy. In the family room it would be hard to see because there isn't a lot of natural light down there, but still. It's always lovely to see them together and peaceful. And they're helping, which often makes them happy. Also, it's giving them practice for when we paint the house, since I'm hoping to enlist them to paint the back patio railings! Can't the same be said for winter? And, I should have found this quote yesterday, when it was 90-some degrees with 95% humidity! Today it's down to the mid-70s with no humidity...but still I like the quote. Emily sent the news as an email from Ella, which was so cute--imagining this little 14-month-old busily typing away to friends and relatives. I especially liked this: "Mama also thinks the baby will be able to share my clothes at the rate I'm going, which I don't find very funny!" Anyway, it will be wonderful to have a new member of the family, and something to look forward to in the drear of winter! Happy news. Today Jenn and I got to have a nice long conversation on the phone--since she moved away in December, we don't get to talk nearly often enough. While Rachel and her daughter, Julianna, talk on the phone for hours just about every day, Jenn and I have so much to do (we both homeschool, we both have 4 kids!) that we're lucky to chat once a week. The funny thing we've both noticed is, every child in our home can be occupied and happy, but the minute we settle in to talk, everything erupts into chaos. Elijah falls off a chair, Ben and Julia start fighting, Noah screams in the background, Isabella needs a clean diaper, and Emma asks the same question over and over again. But somehow we manage, and end the call refreshed for the rest of the day. We talk about random things--everything and nothing. Kids, homeschooling, organization, shopping, husbands, books, TV shows, sleep or lack thereof, meals, desserts--you know the kid of conversation you can have and it feels like your friend still lives a mile away and you'll see her later on that day. Anyway, it's always nice to catch up. Someday we'll be able to do it without kids interrupting every three seconds (I hope!) And she's coming to visit Long Island in just 16 days....I can't wait! Today the heat wave broke! A gorgeous day, sunny, breezy and no humidity, temperatures in the low 80s. Couldn't have been more perfect. We finally shut off the air conditioning and opened all the windows, and had a beautiful day. A lazy time over coffee while the kids played, then Matt watched "The Hobbit" with them while I took Rachel to run a couple of errands. Then I went out in the yard and trimmed bushes while Matt cleaned up other areas of the yard and fixed a new toad habitat for Romeo and Juliet--they now have real dirt, fortified with a brick wall so it doesn't slide into the water, and--ta da!--moss and grass planted right into the dirt. They seem to love their new home. Then Matt got the grill started while I showered off all the bits of leaves and sweat from my yard work, and we had a beautiful dinner on the patio of grilled chicken, pasta salad with veggies, and strawberries and melon. We cleared up, put a fresh table cloth on the table, and sat down by candlelight to watch the kids run and play in the yard with Sophie--they made up some games, then had light up bracelets when it got dark and caught fireflies and played night tag. Now everyone is ready for bed, and will go down like a ton of bricks! And August 3rd wouldn't be complete without wishing our good friend, Chris Stairs, a Happy Birthday, too! Today our boy Ben is 5! He started the day eating breakfast with Daddy, and opened one present (so I didn't have to get up at the crack of dawn....) with him--a whole flock of dinosaurs from Grandma Barbara. He loves them, and spent quite some time playing with them with Julia before Emma, Rachel and I were up. When the rest of us rolled out of bed, we got dressed immediately. Ben opened two of his gifts from us at the table--a bow and arrow set (suction cup arrows!) and a leather quiver. He was, needless to say, beside himself with glee, and immediately wanted to go out to practice. But wait! There was another gift, and it began with a note from Blackbeard the Pirate and an authentic pirate map...a treasure hunt in the back yard! Rachel made Annie's bunny macaroni for lunch--one of Ben's favorites--and he got to watch "The Return of the Jedi," another top favorite. Our friends Amie and Evelyn are here for a play date, and when Matt comes home from work we will take a picnic to the beach and spend the evening there, swimming, playing and eating. After we get home and bathe, we'll have birthday cake, which Matt worked hard on last night, even decorating to say "Happy Birthday Ben Boy"
Hopefully one of the nicest birthdays Ben has ever had! The "Real Party" will be on August 24, when our family comes out here to celebrate both Ben's and Emma's days with us. Yesterday the girls had their horseback riding lesson. Rachel was on A.Rod--which is a compliment to her because he's the thoroughbred stallion, and a huge horse, so Barbara pays a compliment to someone by letting them ride him. Julia was on Annabelle, one of the gentle mares Barbara uses for the younger kids. At first she was tentative--we hadn't gone to a lesson in a few weeks because of conflicting schedules and vacations. But after Barbara refreshed her memory on how to control the horse, she was doing excellently. All of a sudden, no one knows how it happened, Annabelle started trotting! Julia has never trotted before, and I could see she looked scared. As it happened, Barbara was out of the ring because her 3 year old stepdaughter was at the farm unexpectedly and had fallen off a bench. I was walking with Julia and Annabelle, and I didn't know how to tell Julia how to behave to get Annabelle to stop--not really. I told her to keep calm, and I trotted so I could catch the rein by Annabelle's mouth and pull her to stop, but before I did I could see Julia settling in, really riding, and then assertively pull the reins back. She made Annabelle stop by herself! It was like a glimpse into the woman Julia will turn into some day. Hair has always been important.